On November 21, 1920, more than two dozen people were killed in a pivotal event in the Irish War of Independence, a day now known as Bloody Sunday. 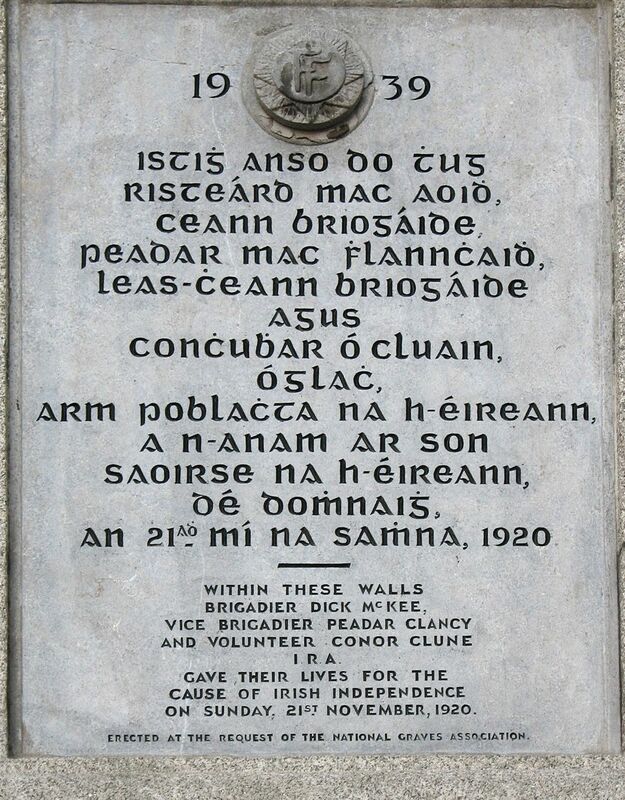 This plaque commemorates three Irish Republican Army volunteers who were tortured and killed on "Bloody Sunday," a brutal day in the Irish War of Independence in 1920. Photograph by Domer48, courtesy Wikimedia. This work has been released into the public domain by its author. On November 21, 1920, more than two dozen people were killed in Dublin, Ireland, in a pivotal event in the Irish War of Independence, a day now known as Bloody Sunday. Victims of Bloody Sunday were Irish and British, civilian and military. Three distinct events made up the casualties of Bloody Sunday. The Irish Republican Army (IRA) carried out the first attack. The IRA supported the overthrow of British rule in Ireland. On the morning of Bloody Sunday, members of the IRA assassinated members of the “Cairo Gang,” a pro-British intelligence unit made up of British Army soldiers, pro-British police officers, and an informant. Members of the so-called “Black and Tans” carried out the second attack. The Black and Tans (nicknamed for the colors of their uniforms) were former soldiers who assisted the Royal Irish Constabulary (the Irish police force). Some Black and Tans opened fire on civilians at a soccer game, killing more than a dozen people, including one athlete (Michael Hogan). The final attack of Bloody Sunday occurred in the evening, as high-ranking members of the IRA were arrested, tortured, and shot by local police. Although both sides suffered casualties, Bloody Sunday is generally considered an Irish nationalist victory. Without information supplied by the Cairo Gang, British authorities had little knowledge of IRA strategy. Perhaps more importantly, the behavior of the Black and Tans at the soccer match turned public attitudes against the British. The Irish Free State was established about two years later. person who supplies information, usually covertly. (Irish Republican Army) (1913-1922) nationalist organization founded to work for Irish independence from Great Britain. person who identifies strongly with promoting the independence (and sometimes the superiority) of their nation. to forcibly remove from power. local, state, or national government organization for law enforcement. plan or method of achieving a goal. identical set of clothes for members of an organization, such as a school or military.